The Institute for Research and Coordination in Acoustics and Music (IRCAM) today proudly announces the launch of IRCAM Lab “TS” as for “Transpose/Stretching”. “TS” is a very impressive time stretch, pitch shifter, remix, formant, noise tweaker that will blow creatives minds with its powerful algorithms based on the unique phase vocoder engine (SuperVP). IRCAM Lab is a new company dedicated to the development of IRCAM’s applications and plug-ins based on decades of pure research and technological innovation. IRCAM Lab TS is available through-out September at the introductory price of ONLY $99 (MSRP $249). IRCAM Lab today proudly announces the launch of “TS” (Transpose/Stretching) a powerful stand alone application that revolutionises the way audio signal can be processed. 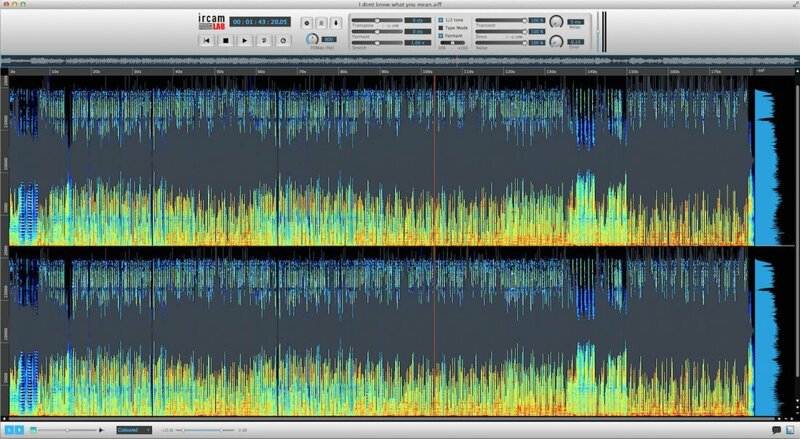 Unlike other time stretching applications, “TS” uses an advanced phase vocoder engine (SuperVP) as for the analysis/synthesis functionalities of “AudioSculpt”. Phase vocoder technology provides high-quality sound processing in real-time and offers amazing results even when used to transpose or stretch audio waveforms radically. It is able to transpose and/or pitch a WAV or AIFF audio file with extremely accurate results and minimal artefacts making it possible to process professional recordings with transparent results. A life saver for audio engineers and broadcast technicians ! IRCAM Lab “TS” also includes real time Midi remote control and a live editing export feature. That enables users to export totally original sounds created in “TS” as easily as clicking the mouse. A DJ’s dream come true ! IRCAM Lab TS is available through-out September at the introductory price of ONLY $99 (MSRP $249). *At this time, IRCAM Lab TS is only available for Mac OS X. Windows versions will be released very shortly as a FREE upgrade to all users. “IRCAM Lab” is a new company owned by IRCAM (Research and Coordination in Acoustics and Music). IRCAM Lab is dedicated to manufacturing powerful audio applications and plug-ins based on decades of research and technological innovation. IRCAM, (Institute for Research and Coordination in Acoustics and Music), was founded by Pierre Boulez in 1977 under the aegis of the Centre Pompidou and the French Ministry of Culture. IRCAM is one of the world’s largest public research center dedicated to both musical expression and scientific research. It is a unique location where artistic sensibilities collide with scientific and technological innovation. Plugivery is an electronic distribution service whose purpose is to introduce audio software products into hundreds of music stores all around the world. Plugivery offers the right web tools that will enable dealers to easily sell more audio plug-ins in their boutiques and/or online stores. Plugivery aims at being a useful bridge between audio software manufacturers and audio resellers.